In these stories, the line between the real and the imagined is blurred as Lucy Wood takes us to Cornwall’s ancient coast, building on its rich storytelling history and recasting its myths in thoroughly contemporary ways. Calling forth the fantastic and fantastical, she mines these legends for that bit of magic remaining in all our lives—if only we can let ourselves see it. LUCY WOOD grew up in Cornwall and attended Exeter University, where she completed a BA in English Literature and an MA in Creative Writing. She currently lives in Cornwall. "Lucy Wood is a sorceress. These stories unfold in a dreamy marine light, one that reveals the miraculous in the everyday. Diving Belles is a perfect name for this debut: It is guaranteed to enrapture a reader, and you'll want to come up slowly from its depths." "What sets British writer Wood apart... is how grounded the magical element is in the reality of her stories... The magic is always embedded, not only in familiar stories from folklore, but in the personal myths of the characters' lives. Thus there is a quiet realism to even the most extraordinary events... This combination of subtle humor and everyday magic makes Diving Belles an engaging collection of contemporary folklore." 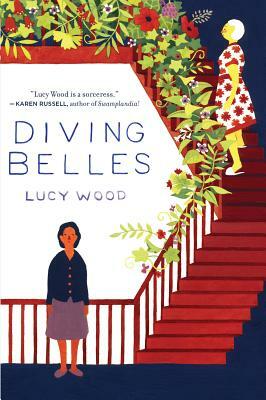 "How easily Lucy Wood in Diving Belles makes magic. In story after story in her debut collection, a previously inert world becomes animated... If part of the exercise of magic is to remind us of the malleable texture of perception (and to awaken our child-like awe at the world), then the magic in 'Notes from the House Spirits' is a wonderful success. Throughout, Wood sprinkles a measured amount of magic, just enough so the rational self can slip away and let the reader wake up her perception and her childlike astonishment at the world again." "Each year, book blurbs tell you that a thousand new writers have fresh, distinctive voices. But fresh, distinctive voices are actually very rare. Lucy Wood has one." "Lucy Wood has an intensity and clarity of expression, deeply rooted in a sense of place. Her stories have a purity and strength, and an underlying human warmth; they resonate in the mind." "These stories are brilliantly uncanny: not because of the ghosts and giants and talking birds which haunt their margins, but because of what those unsettling presences mean for the very human characters at their centre ... A startling, and startlingly good, debut." "These are stories from the places where magic and reality meet. It is as if the Cornish moors and coasts have whispered secrets into Lucy Wood’s ears and, in response, she has fashioned exquisite tales of mystery and humanity. In her prose, the fabulous moves across the everyday like the surf moving over the shore, shifting it in subtle measures, leaving it altered in its wake." "Wood captures something fresh, fantastical and eloquent...These stories express a distinctive voice and a gently beguiling imagination." "Whimsical...Lovers of fairy tales and Celtic lore will take pleasure in immersing themselves in the rich, magical world Wood’s tales inhabit." "Aching and mystical...These are distinctively grown-up fairy tales that re-create a sense of wonder and imagination without the moral endings of their childhood counterparts, but, like them, linger in the imagination." "These tales are soaked in the magic and folklore of the place—but the magic is often an expression of inexpressible human emotion…Wood’s imagination is extraordinary; she has an instinct for the inner meanings of myths that echoes the great Angela Carter. Superb." "A vibrant new voice ... Why read it: for her distinctive voice and sense of place." "Llovely and intriguing ... Wood pulls off a careful balancing act between fantasy and reality, folkloric past and prosaic present...Winsome, quirky, and sometimes enchanting, Wood’s stories seem to fish about in rock pools of imagination... Her gift… is for conjuring up gentle suspensions of disbelief." "Cornish folklore for the modern day, done in a beautiful, spooky way." "This bewitching short story collection draws its power from a deft blend of Cornish folklore and everyday contemporary cares. Centered mostly around women—young women, old women, women becalmed somewhere in between—magic encroaches upon their narratives as slowly but surely as the incoming tide, so that even the most outlandish goings-on come to seem natural." "A winning combination of spooky mystery and toast-and-tea coziness, with much warmth and tenderness." "Cornwall’s magic casts some pretty strong spells. The stories in Lucy Wood’s debut collection have a distinctly otherworldly sensation to them—slightly surreal, steeped in enchantments and shimmering with an infusion of the area’s folklore and landscape… Wood strikes a sure and canny balance of worlds colliding and merging; her wry and gentle humor emphasizes that fusion all the more."